Willow is not eating. She's so thin... and in so much pain. My heart is breaking... This image doesn't even show how awful she looks. Martha says she feels like we are back where we started, but I fear it's worse than that. With a broken leg and 8 weeks of stall recovery, we have even more obstacles to overcome. They told me she wasn't eating all her food at the hospital, and since her last choking episodes, her appetite has decreased more and more. Last night, she didn't touch her grain or her hay. We know that Willow does not like medicine. She hates the Gastro-Guard (which she needs for her ulcers) and she doesn't care for the Bute either... but she needs it for her pain. And she is in so much pain. She is constantly shifting front feet, pawing at the ground (seeing that breaks my heart more than anything), and bending her front legs because she just can't get comfortable. She no longer holds her head up high, but hangs it low most of the time. And for the first time ever, Willow has worried eyes... I've always been amazed that she doesn't have them, but now above her eyes is furrowed... and she looks worried and stressed. I called Martha in tears this morning... she called Dr. Ruggles and Dr. Kimmons. We are making a plan of what to do. Right now, I'm going back out to the barn to be with Willow. It's raining and gloomy outside. And the classical music in the barn makes me cry. Oh no! poor baby. My horse hates bute and won't eat for hours after. what form are you giving? They have flavored powder bute that she might like? Another thing I do with bitter meds is mix it with baby food. Usually carrot or sweet potato and I syringe it in the mouth. My horse doesn't mind that flavor so much. I know this doesn't help the eating issue. I'm very worried about her as well. I'm going to stay tuned. . . . I was actually going to say that pain meds came as injectables. :) Horses are very, very easy to give injections to, which helps. And I'm sure Martha has tried it/recommended it, but with the older fellows who lose appetite, we will top with cane syrup or straight molasses. Be strong for her. My thoughts and prayers are with you all... please keep us posted. hang in there momma bear. take it one hour at a time. praying for your baby!! lots of love from louisiana! Im praying for her..... I sure hope she pulls through this. Oooh no! Saying prayers for her now! Sending you strength, healing thoughts and a hug! Glad you have a team of people that are helping guide you through this. I am so sad to hear this. praying for strength and healing! Hi Shana- thinking of you and Willow and your family- keeping you in my heart and prayers. I am praying for all of you!! 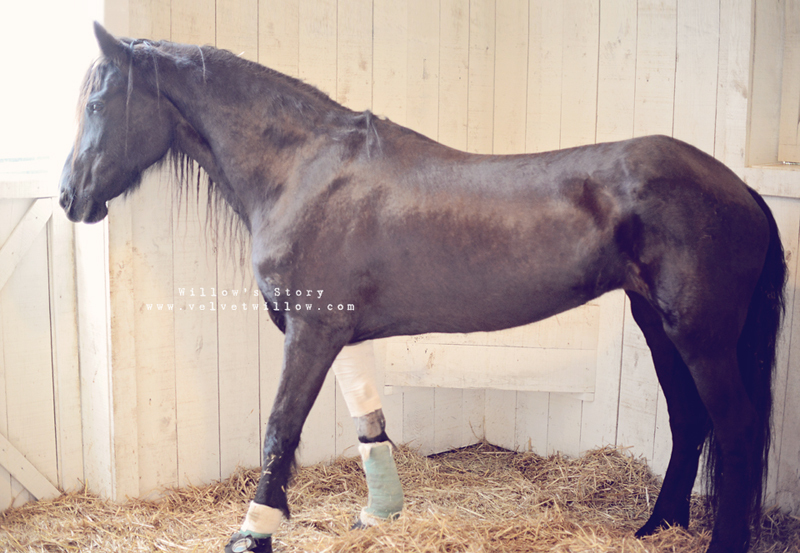 My horse broke her leg and she was in so much pain. we did all we could but in the end she gave us this look and we knew we had to let her go. I hope you aren't faced with that type of difficult decision but we had to do what was best for her. I miss her all the time but it gives me peace knowing she isn't suffering anymore. She did not. her front leg was shattered. another horse kicked her while outin the pasture. the vet said it was inoperable. This just brings tears to my eyes. As such an animal lover I know how hard to watch our 4 legged children suffer. You and willow are in my thoughts! I'm a fellow horse owner who also has Dr. K for her equids. He told me about your dear Willow (although not by name) the day she was injured and went to R&R, where I'd taken my Teddy several times for his foot soreness, ultimately receiving a diagnosis of navicular syndrome. He's now living at Uncle Kimmons' until space in a good retirement home opens up. So when I saw your story on the Rood & Riddle Facebook page, I started following your blog. You have taken on so much and have been doing such a magnificent job! From the ups and downs of dealing with Teddy's navicular, I know how hard this is. You are doing absolutely everything a loving owner can do for a horse, and Willow is so lucky to have you. As Nicola said, both the pain killers and the effects of the surgery are likely to have had an impact on her appetite. Plus, when I broke an ankle and had it surgically repaired (titanium plate and screws, just like your girl), I found it was more painful as the healing proceeded. I hope that as the bitter taste of the meds recedes, she will regain her appetite and with it, gain strength. Stay strong, and listen to your heart and hers. And remember that humans often have some difficulties getting over anesthesia. Maybe Willow's dealing with that? Praying for sweet girl to get stronger each hour.